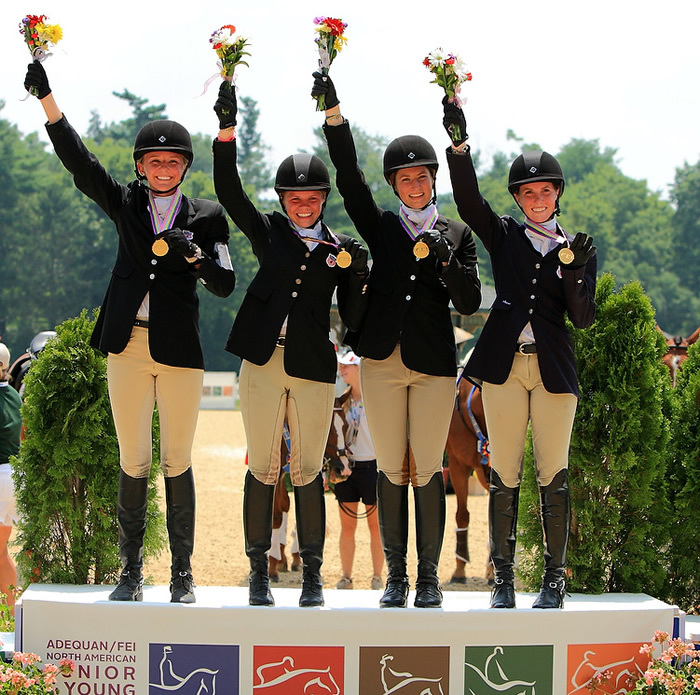 Avery Klunick, Alyssa Phillips, Alexa Ehlers and Victoria New, USA Area 5's Gold Medal Junior Eventing Team Champions. Photo: FEI/Anthony Trollope. Lausanne (SUI), 1 August 2011 – A heat-wave and thunderstorms failed to throw the next talented generation off their stride at the FEI North American Junior and Young Rider Championship which came to a thrilling conclusion at the Horse Park In Kentucky, USA yesterday. Open to riders from the USA, Bermuda, Canada, Mexico, Puerto Rico and the Caribbean Islands, the five-day action-packed fixture attracted 250 entries, all hoping to make their mark in the five disciplines of Dressage, Endurance, Reining, Jumping and Eventing. US Region 5 captured Young Rider Dressage Team gold. Aylin Corapcioglu (Ruhmann), Madeleine Birch (Uceri), Catherine Chamberline (Verdicci) and Brandi Roenick (Pretty Lady) completed with a combined score of 198.104, but only pipped Canada BC/QC – Emily Fownes (Frapuccino), Mathilde Tetrault (Michelango), Anna Mylai Messier (Marzipan) and Esmee Ingham (Norseman) – by just over one point, while USA Region 8 were less than another point further adrift in bronze. Roenick produced the highest score of the competition, 69.289, and the 16 year old from Arizona complimented her team-mates: “It’s an awesome opportunity to ride with these girls and really get to know them,” she said. Canada’s Esmee Ingham put the Canadian silver medal in context. “Since British Columbia is on the West Coast and Quebec City is so far east, for us to come together as a team having never met, and to take a medal is really incredible!” she pointed out. Roenick had to settle for silver in the Individual Championship however when Isabelle Leibler (Watson) took gold and fellow-American Chase Hickok (Palermo) claimed the bronze. And it was Hickok who moved into silver medal position in the Freestyle in which Leibler’s flawless performance with her 14 year old Westphalian gelding earned a winning score of 74.00. “He just felt like he was right there for me… it was the most amazing feeling,” Leibler said. Mackinzie Pooley claimed the bronze with her last ride in international competition with the 20 year old Oldenburg Jonkara. Gold medalist Young Rider Katherine Dinan. Photo: Sportfot. 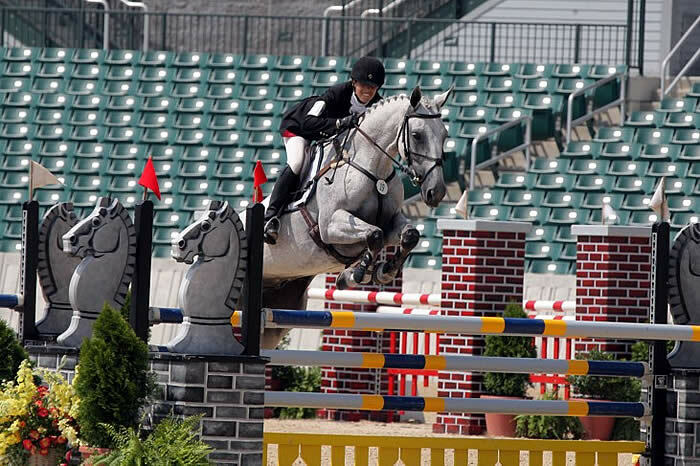 Lexington, KY – Young Rider Katherine Dinan piloted the 13-year-old New Zealand Thoroughbred-cross gelding, Vancouver, quickly and carefully around the Rolex Stadium on Sunday to finish with a score of 10.14 – and a Gold medal. It was the final day of jumping at the USHJA North American Junior and Young Rider Show Jumping Championship at the 2011 Adequan/FEI North American Junior & Young Rider Championships presented by Gotham North. “I was a little nervous going into the first round [today],” said Dinan, from Zone 2. “Coming in on top, there was definitely some pressure. I thought my horse jumped really well today. I had two verticals down in the first round… but he jumped really well in the second round. I was proud that he pulled it together. Finishing just behind Dinan in Silver-medal position were Zone 4’s Samantha Senft and Early Morning-a 9-year-old Dutch Warmblood mare, who amassed a total score of 10.24. CCI2* Gold medalist Devon Brown on Dynamic Image. Photo: Sportfot. 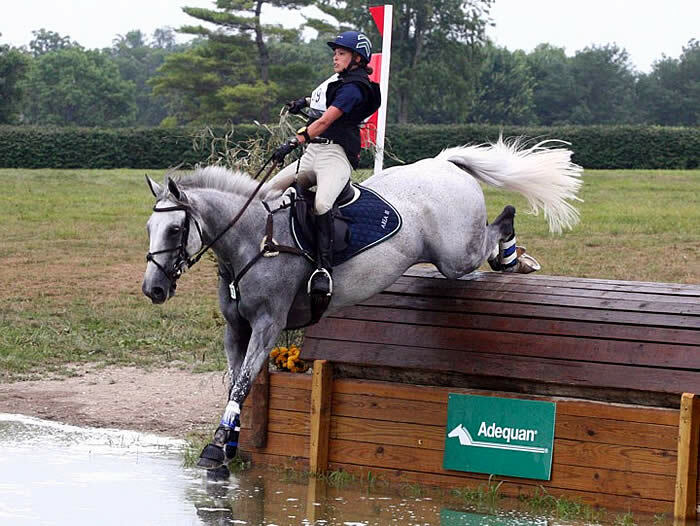 Lexington, KY – Sunday’s USEA North American Junior Eventing Championship closed an action-packed week of competition at the 2011 Adequan/FEI North American Junior Rider & Young Rider Championships presented by Gotham North. 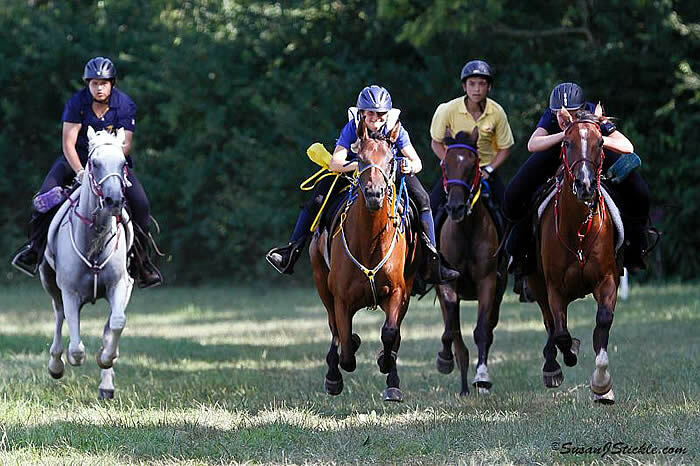 The intense heat that plagued the area was a challenge for the eventers as well, but the majority of the horses and riders looked fresh and ready to complete the event. Devon Brown and Dynamic Image (Area III) led the CCI2* from start to finish after posting a flawless show jumping round to finish on their dressage score of 50.5. The pair was awarded the Individual Gold medal after making easy work of the show jumping course. “It’s unreal,” she said after her ride. “I came here just hoping for a good run in all three phases and to give him a good confident run. I was a little worried because he hadn’t done much all spring. It was just amazing. He just went above and beyond and just tried his heart out. Jumping all the way from seventh to take home the Individual Silver medal was Area V & IX’s Jacob Fletcher with his flashy colored Australian Sport Horse gelding Falcon Splash. The pair jumped double clear over both the cross-country and show jumping courses to finish on their dressage score of 57.2. Lexington, KY – It was a stormy afternoon at the Kentucky Horse Park for part of the USDF/Platinum Performance North American Junior and Young Rider Dressage Championship at the 2011 Adequan/FEI North American Junior & Young Rider Championships presented by Gotham North, but storms could not dampen the brilliance of the dressage being performed. Competition was suspended at approximately 3:30 p.m. when a thunder and lightning storm passed through the area, knocking out electricity at the Rolex Stadium. But thanks to the quick work of the Organizing Committee and Kentucky Horse Park staff, the show soon resumed. The Young Rider division was intensely competitive, punctuated by the last rider’s flawless freestyle. Isabelle Leibler and Watson 108 representing Region 8 were rewarded for their brilliant test with a score of 74.00%, which earned the pair the Individual Gold medal. Lexington, KY – After dressage in the CCI**, Area III’s Devon Brown and Dynamic Image sat atop the leaderboard – and Brown refused to relinquish her lead Saturday at the USEA North American Junior and Young Rider Eventing Championship at the 2011 Adequan/FEI North American Junior & Young Rider Championships presented by Gotham North. Brown piloted Donna Miller’s flashy grey Irish Sport Horse gelding through the cross-country course to a fault-free round with a time of 8:31, well within the time allowed. The clean trip around David O’Connor’s cross-country course left the pair with a two-day score of 50.5. Brown said she was most concerned about the double corners and the angled huts, but she had no problems navigating the challenges. Although some riders had challenges with slippery footing in some parts of the course, Brown didn’t think it impacted her ride. 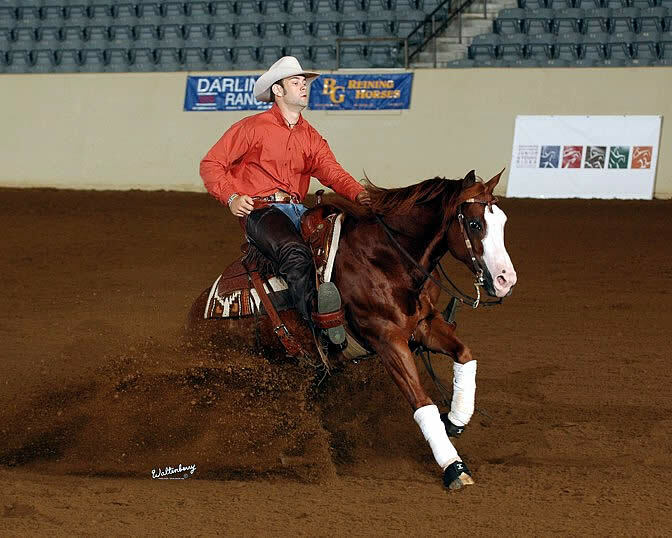 Lexington, KY – Will Letner knew the bar was set high when fellow U.S. rider Laura Sumrall went out first into the Alltech Arena on Saturday – and came out with an impressive score of 217.5. Sumrall pumped her fists in the air, shouting, “Yes, yes!” at her first SmartPak Individual Reining Championships at the Adequan/FEI North American Junior & Young Rider Championships presented by Gotham North. Letner’s thought: “Well, where do I go from here?” And he’d have to wait for 18 more riders to go before him to find out. As it turns out, the best was saved for last. The 20-year-old from Harris, MO, topped Sumrall by a whole point, earning 218.5 from the judges – a number that left his cowboy hat flying into the air, the crowd cheering, and Letner with a Gold medal. Sumrall, who won the Silver medal, knew she could do better than she did at Thursday night’s Team Reining Championships, also held at the Kentucky Horse Park’s Alltech Arena. Her horse, Einsteins Fancy Pine (aka “Smartie”) spooked and “I nearly fell off,” Sumrall said. Choking back tears, she walked off with a zero score. Endurance photo finish on a hot Kentucky summer day. Photo: SusanJStickle.com. 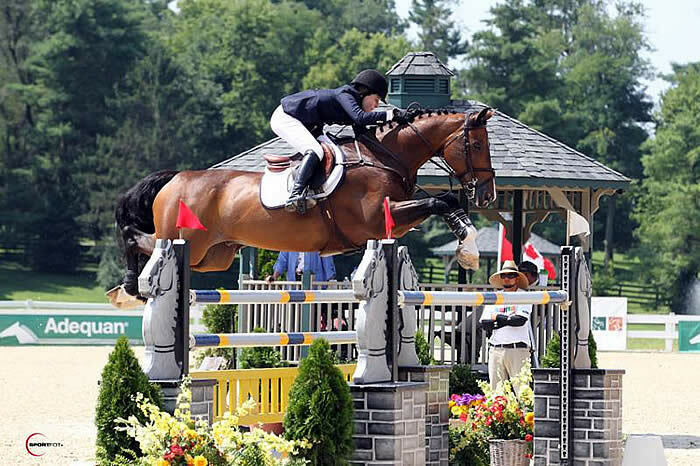 Lexington, KY – For first time in the event’s history, the Adequan/FEI North American Junior & Young Rider Championships presented by Gotham North played host to the North American Young Rider Endurance Championship. The competition included both CEI2* and CEI4* divisions which were completed yesterday, and team medals were presented today in both divisions. “I just took it slow and easy,” Florida-resident Russell said. “I tried to let the horse pace themselves because they’re good at knowing how fast they can go. “They were really nice trails, really well marked,” she said, adding that although the grass was “a little slippery,” she used a combination of Renegade boots and mud nails to gain traction. Area VII's Florence Miller sits atop the CCI*. Photo: Diana De Rosa. Lexington, KY – The 2011 Adequan/FEI North American Junior & Young Rider Championships presented by Gotham North continued today at the Kentucky Horse Park with Junior competitors completing the dressage phase of the USEA North America Junior Eventing Championship. Topping the leader board of the CCI* event is Florence Miller of Area VII who ended her dressage test with only 47.3 penalty points aboard her horse, Tuscan Sun. Area V representative Alyssa Philips and Sundance Bay are a little more than four points behind Miller while Sable Giesler and Evil Munchkin of Team Ontario are sitting comfortably in third. The cross-country phase kicks off at 8:00 a.m. on Saturday, and the top Juniors have already walked course. 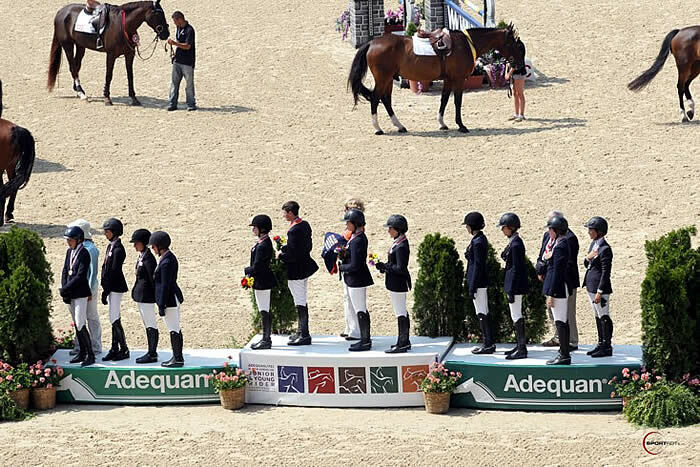 Junior Gold Medal Jumping Team, U.S. Zone 4. Photo by Sportfot. 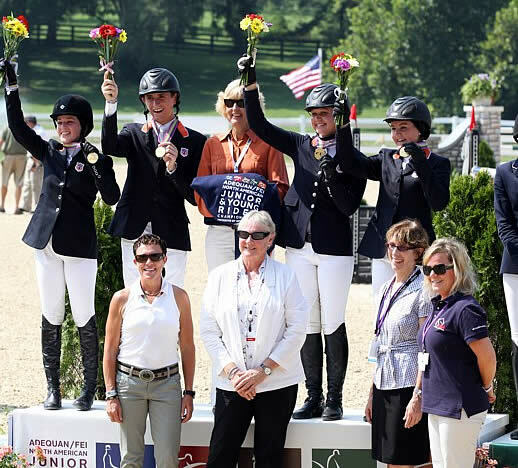 Lexington, KY – It was a clean sweep for the U.S. when Junior and Young Rider Show Jumping Teams vied in the USHJA North American Show Jumping Championships today. In the Junior division, the team from U.S. Zone 4 led the victory gallop with their Gold medal in tow while the U.S. Zone 2 carried the Silver, and U.S. combined Zones 1/6 took the Bronze. Michael Hughes and Shockwave, Hayley Barnhill aboard Toucan Tango, Hasbrouck Donovan on Delilah, and Frances Land with Merlin earned the first-ever Gold for Zone 4 with a team total of only 12 faults after two grueling rounds in the Rolex stadium. While a steady four on the outside line and a difficult water jump caused rails to come down for many, the Zone 4 team persevered. Barnhill, aboard the 9-year-old Tango, went clear for both rounds, one of only six to do so.